Vein of Labbé is also known as Inferior anastomotic vein, connects the superficial middle cerebral vein of Sylvius from sylvinan fissure to the lateral sinus. Vein of Trolard is also known as superior anastomotic vein connects the superficial middle cerebral vein of Sylvias from sylvian fissure to the superior sagittal sinus. 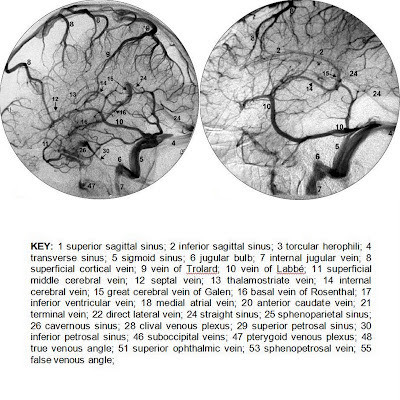 The dominance of these anastomotic veins is dictated by the relative size of the superficial middle cerebral vein and the other anastomotic vein. There is inverse relationship between the size of the superficial middle cerebral vein, the anastomotic vein of Trolard and the vein of Labbé, as all three share a same drainage area. Clinical significance : Isolated thrombosis of these vein is known, where MR Venogram may show controversial findings like normal or congenital absent ipsilateral lateral sinus with an adjacent hemorrhagic venous infarct which may be mistaken for hemorrhagic contusion. The venous drainage of the brain and meninges can be divided into the diploic veins, meningeal veins, dural sinuses, as well as the superficial and deep cerebral veins. Dural venous sinuses are the major intracranial drainage channels lined by opposing layers of dura, are valveless and trabeculated. The major dural sinuses include the superior sagittal sinus, inferior sagittal sinus, straight sinus, occipital sinus, transverse sinuses, petrosal sinuses, sigmoid sinuses, sphenoparietal sinuses and cavernous sinuses. Superior sagittal sinus drains the superficial cerebral veins from the medial and lateral surfaces of the cerebral hemispheres, run antero posteriorly in the midline in a shallow groove along the inner table from the foramen cecum of the crista galli to the torcular Herophili. The torcular Herophili is the confluence of the superior sagittal sinus, the straight sinus, paired transverse sinuses and sometimes the occipital sinus. The inferior sagittal sinus travels antero posteriorly along the inferior free edge of the falx, joins great cerebral vein of Galen and ultimately drain into the straight sinus. The straight sinus runs antero posteriorly in the mid line from the junction of the falx cerebri and the tentorium to the torcular Herophili. The occipital sinus is the smallest of the dural sinuses, may be present as accessory sinus, communicate torcular Herophili with the internal jugular. The paired transverse sinuses begin at the torcular Herophili and run antero laterally to become the sigmoid sinuses when turning inferiorly and medially at the posterior aspect of the petrous temporal bones. The transverse sinuses run in a groove along the inner table along the peripheral edge of the tentorium. In 25% of the cases, the transverse sinuses are unequal in size. An atretic segment in ~5%. In most of the cases the superior sagittal sinus drains preferentially into the right transverse sinus, while the straight sinus drains preferentially into the left transverse sinus. The superior petrosal sinus extends from the posterior aspect of the cavernous sinus at the petrous apex to the sigmoid sinus along a dural attachment of the tentorium to the petrous temporal bone. It provides venous drainage from the pons, upper medulla, cerebellum, and middle ear. petrosal sinuses are interconnected with the basilar venous plexus of the clivus and the intercavernous sinus (or circular sinus) to communicate with the cavernous, superior petrosal, marginal, and occipital sinuses. The sphenoparietal sinus drains the superficial middle cerebral vein running along the greater sphenoid wing to the cavernous sinus. The sphenoparietal sinus often anastomoses with the basal vein of Rosenthal. The paired cavernous sinuses are irregularly paired venous spaces that lie on either side of the sphenoid bone in the central skull base region. They lie on either side of the sella turcica. The internal cerebral veins are paired course posteriorly in the roof of the third ventricle between the leaves of the velum interpositum. The internal cerebral veins deviate from the midline at the pineal recess and proceed along the superolateral surface of the pineal body to converge at the level of the inferior splenium of the corpus callosum to form the great cerebral vein of Galen. Just before the convergence of the internal cerebral veins, the basal veins of Rosenthal join their ipsilateral internal cerebral veins. Source: NEUROVASCULAR ANATOMY AND PATHOLOGY, Neil M. Borden, MD.